As the popular saying goes, “Every dog has its day”. For Pet Therapy Volunteer Toni Barkston (yes, that’s her full name! 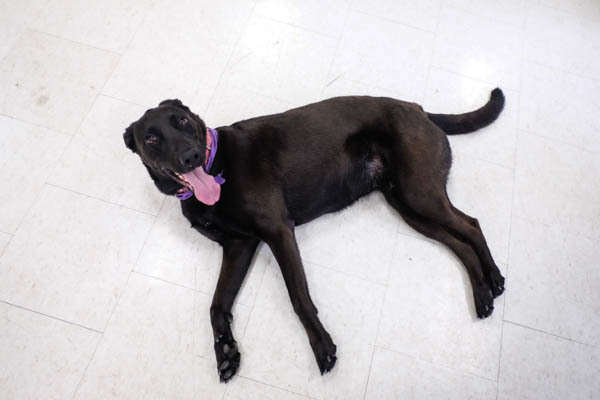 ), a five-year-old Black Lab mix, and her human owner Gina Kish, that day is Sunday. 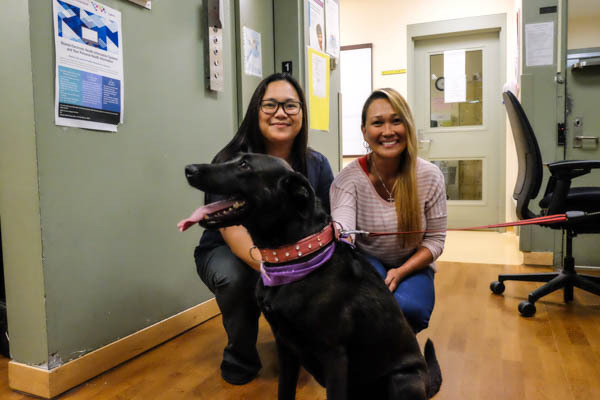 For the past three years, Toni and Gina have been visiting CAMH’s inpatient Unit 3-1 every Sunday as part of CAMH Volunteer Services’ Pet Therapy Program. The secure unit, which serves both as a women’s forensic unit, and an acute care unit for male patients with complex mental illness, operates under strict procedural regulations. On the surface, Toni and Gina’s visits seem simple and straightforward. 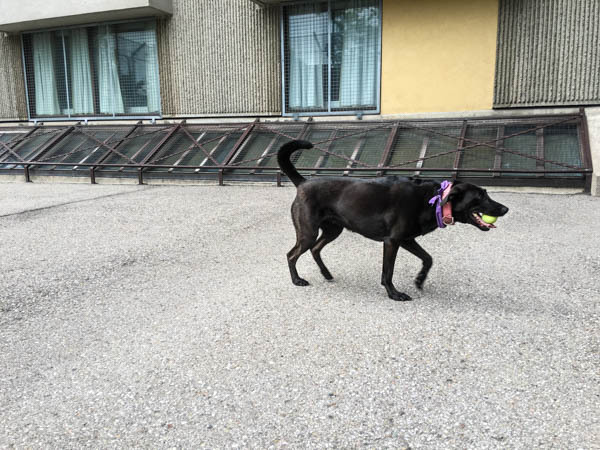 Toni will spend time with small groups of clients for about 20-30 minutes in the fenced-in courtyard or inside the common areas, where they’re free to interact with Toni in various ways. Some clients opt to play fetch, which Toni is more than eager to accommodate – just don’t expect her to bring the ball back right away. Others feed her treats or help brush her fur when she’s shedding. And others are just happy with the occasional pat on the head. It’s during these designated recreation times where it’s easy to see the significant change in clients’ demeanor. “One thing we specifically wanted was to have clients interact with Toni out in the yard. If you see our yard, it looks very much like it’s from the correctional model and setting. The women’s unit is a forensic unit, but the men’s unit is not. Having Toni running around in the yard, playing fetch with clients or even just lounging around, helps to normalize it. 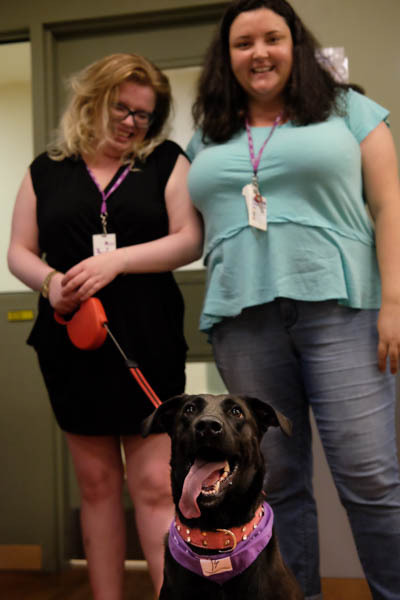 Her presence makes the environment less institutional,” says Recreation Therapist Margaret Darragh, who has been working at CAMH since 2014, and was instrumental in bringing Toni and Gina to 3-1. The normalizing effect of having a dog in the unit was not lost on me either. I’ve visited Unit 3 several times before, but during this visit, one client was adamant that they did not want me to bring a camera into the yard, and was initially wary of my presence. But after spending time with Toni and having the shared experience of playing with and caring for the dog, the client’s mood lightened, and they were okay with me using my phone to take photos of Toni. 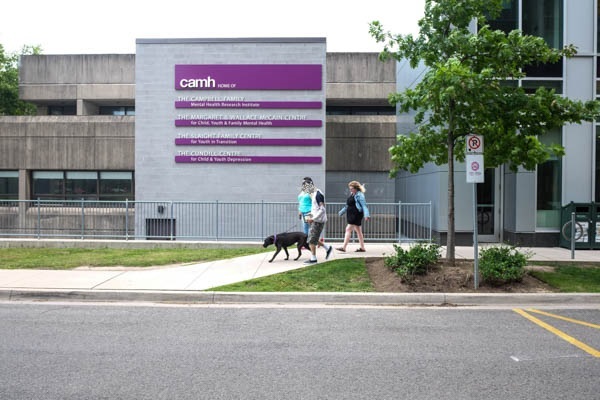 During the session, the client opened up a bit more about their experience at CAMH, and spoke about looking forward to the future after their inpatient stay. “Before I went back to school to take up therapeutic recreation, I worked at a dog daycare. 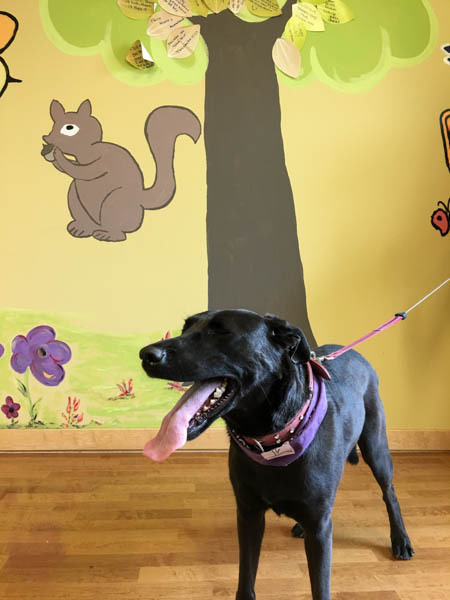 And when I was in school, we learned about the benefits of pet therapy,” recalls Margaret. 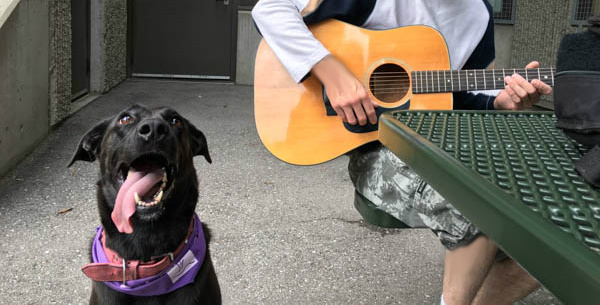 Her positive experiences with dogs were partly what prompted her to reach out to Volunteer Services to inquire about CAMH’s own Pet Therapy program. Aside from spending time in the unit with Toni, clients who have a hospital pass are encouraged to take the dog for a walk around the Queen Street site. 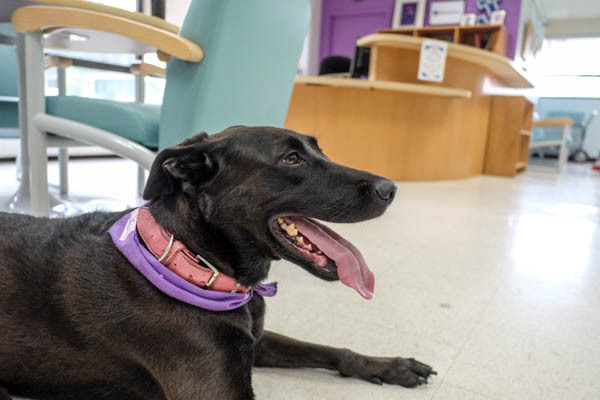 “Sometimes, petting her will help clients reminisce about when they had their own dog, or can open up discussions about their past,” adds Margaret, who admits that Pet Therapy is one of the interventions that most clients will participate in if they can. Toni’s presence isn’t just for the clients’ benefit, however, and Margaret makes sure staff are also able to spend brief moments with the dog if they choose. There’s no bone to pick here – whether you’re a client or clinician, there’s merit in pet therapy, and bringing a dog to ‘heal’ is a trick that isn’t hard to teach.